Do you know you could convert your favorite YouTube video to iPhone ringtone? I bet you don't. I can only imagine how thrilling it is for you to have come across this article right now. How awesome is it to know you can actually end the misery of using that beep boring ringtone and take charge. With millions of captivating music videos made available for you, there are unlimited options for you to create a custom iPhone ringtone, or even create and assign different ringtones to different contacts. Whether you’re just getting to know about this fascinating topic now, or you’ve heard of it but still haven’t found a way to go about it, we have created the perfect article to guide you step by step on how to make a ringtone for iPhone from YouTube with ease. Part 2: How to Transfer Created YouTube Ringtones from Computer to iPhone? 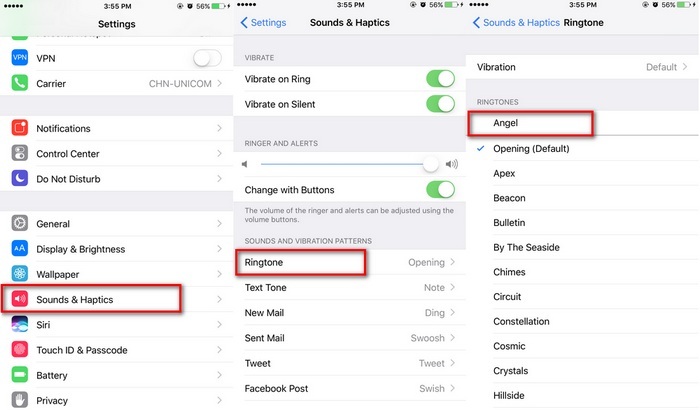 Part 3: How to Set YouTube Ringtone on Your iPhone? Visit YouTube website on your computer and search for the video you want to convert to ringtone. Click to open the video like you want to watch it. From the address bar, copy the video URL. Open a fresh tab on your browser and proceed to the free ringtone website. At the top menu, select Make Ringtone. 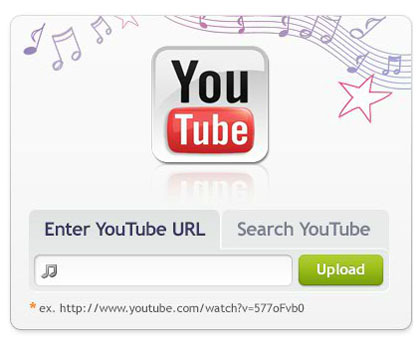 You’ll see a space where you can paste the YouTube video URL you copied. 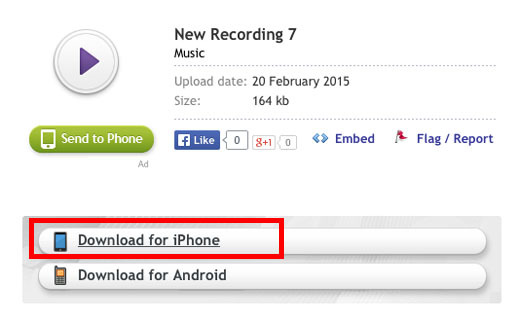 Click and drag the arrows to choose desired audio for ringtone. Tick the Fade In and Fade Out boxes according to your taste. Click on Play to preview the ringtone before saving. Remember the maximum length should be 40 seconds. Give the song a befitting title. The laterst version of iTunes has Tones tab hidden, which makes it impossible to sync ringtones from computer to iPhone with iTunes. In the following part, we will show you how to transfer created YouTube ringtones from computer to iPhone with an iTunes alternative - iMyFone TunesMate. When you’re in need of a completely effective and efficient tool for managing your iDevices, iMyFone TunesMate is the answer. Now you can sync and transfer media files easily from your computer to your iPhone or from iPhone to computer. Which means you can now send that newly created YouTube video ringtone to your iPhone without stress. You can also transfer all kinds of files without iTunes, instantly backup your files and data, and bypass all frustrating iTunes restrictions. Effortlessly extracts your files from iPhone to a computer, external hard drive, iTunes, or media player. 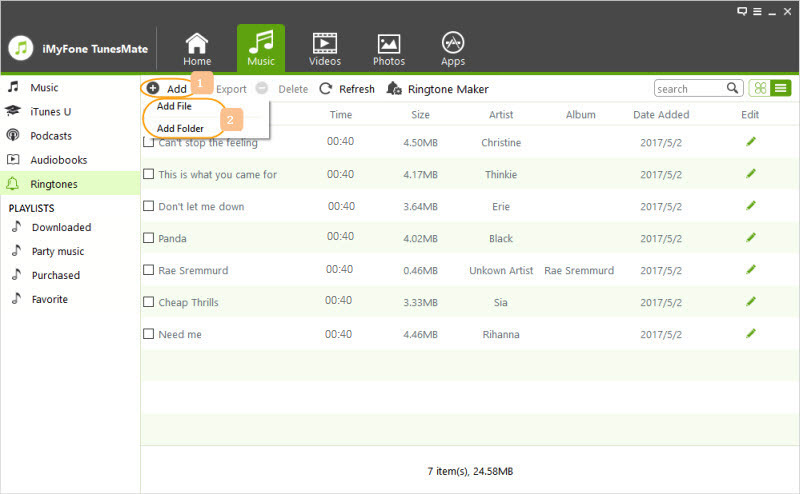 Allows you to ransfer all kinds of media files including ringtones, audiobooks, videos, TV shows, photos, music, etc. Transfers files from your computer to iPhone or from your iPhone to computer. Compatible with all kinds of files and contents downloaded from the internet, Google play store, or Amazon store. Allows you to bypass iTunes with ease and transfer files directly from your computer to iPhone. From the top menu on the screen, choose Music, and then select Ringtones. Click on Add File or Add Folder. Locate the ringtone on your computer and select it. Hit Open to begin transfer. Click on the Settings app on your iPhone to open. Find Sounds & Haptics (Sounds for older devices) and click on it. Find Sounds and Vibration Patterns section, click on it. Click on Ringtone. It’ll bring out a list of ringtones for you to choose from. 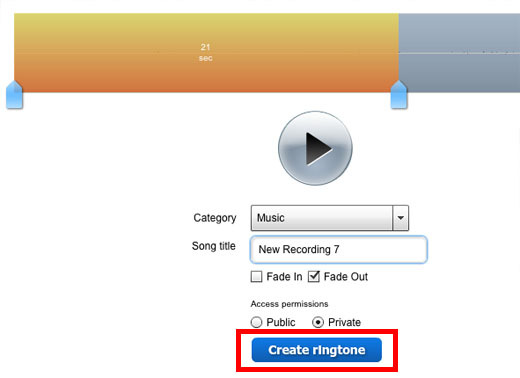 Scroll to look for your newly created YouTube ringtone, select it and you’ll be able to listen to it play. And that is how you can successfully convert a YouTube video to iPhone ringtone, transfer it to your iPhone using iMyFone TunesMate and then set it as your ringtone.